As a reviewer, you know for a fact you're late with a promo when the band behind it manages to break up before you get around to reviewing the album. 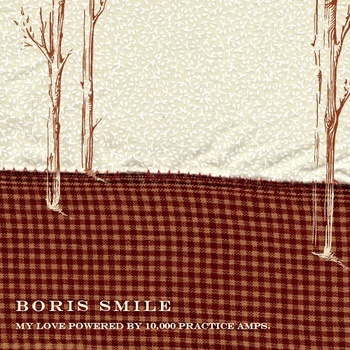 This is the case with "My Love Powered By 10,000 Practice Amps" by Boris Smile, an indie/pop collective with a line-up that rotated around singer/guitarist/pianist/composer A. Wesley Chung, until the group ceased to exist some twelve days ago. Normally I would be sort of embarrassed being this late, but this time around I'm rather a little sad, because since finally getting around to spinning ".. 10,000 Practice Amps" I've had to face the fact that I've been kept away from a pretty damn good album for far too long. 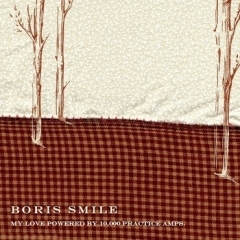 It's been a reluctant realisation, as I've approached the album with my usual reservations about records with a track count in the twenties, but as it turns out, Boris Smile have so much different talent in its ranks, and reference so many different sounds and styles, that twenty-three short pop-songs rarely feel like too much. I guess it wouldn't though, when over the course of it's one hour and five minutes of running time it manages to remind me of as many different artists as; Dear & The Headlights, Paper The Operator, Lemuria, Into It. Over It., Everyone Everywhere, Weezer, Mewithoutyou, Pavement, Battle Creek and Panic At The Disco (@ "Pretty. Odd") - and that's just to name a few really. 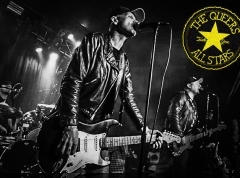 The average song on ".. 10,000 Practice Amps" revolves around a relatively simple melody, often provided initially by acoustic guitar, and then grows gradually and swiftly, by employing various elements from more and more of the band's contributors. On the instrumental side, this means that keys, drums, bass, trumpet, tuba, trombone, clarinet and/or lap steel might eventually lend their sounds to the songs, and vocally, Chung's soft, very Dear And The Headlights-, emo-ish singing is often joined by the equally subtle voice of Abigail Davidson, who reminds me a bit of the female singer in Lemuria. When it all comes together, the result is a veritable parade of joyous, carefree little songs, that emit love and positive vibes while celebrating good melody and catchy choruses. The cluster between track seven, "Mother Hen (Are You A Shelter)" - which is easily the best song on the disc - and track ten, "Fox And Amelia", will likely be the first period to open the ears of the listener, as both of those songs, as well as "Queen Of Green Welly", all provide lines to pick up on and hum along to on first listen. Slightly later "Collecting My Thoughts" also gives off a nice, dorky By Surprise-ish vibe, with lyrics about how 'the imperative is too categorical', while "A Man Stands Alone" offers a good doze of melancholy. Now, while other cuts such as "You Are Loved" and "When Steven Walked On Water" are also nice, it must be admitted that the record can get a little long in the teeth approaching the final tracks. There are a couple of things that lead me to forgive it for this though. Firstly tracks like "Abajazz" and "Greatham Is Great" - which are basically just recordings of the band talking and messing around - add to the light-hearted, super friendly feeling of the record, and work as nice little marks of progress for the listener. Secondly, this is the band's last record together, so with there not being a new album coming up, I think it's only fitting that the guys stuffed as much as they could into this one. Furthermore, when the music is as engaging, forthcoming, and diverse as that of Boris Smile, it's just really, really hard to not come away from this record with a smile on your face, every single time you hear it.